To those of you who are celebrating, happy Christmas eve! For those of you who aren’t, hope you’re having an excellent Thursday! I can’t deny, I certainly feel it’s been an excellent Thursday for me! Last night I finished reading Lost Stars, one of these books in the Journey to the Force Awakens series. It’s a young-adult novel that follows the careers of two children through their lives with the Imperial service, and it’s actually not that bad. Sure, it suffers from a little too much coincidence at times, much in the same way the novel Death Star seemed to take place just an inch or so to the left of the screen. Despite this, however, there were some very interesting developments over the course of the novel, particularly seeing the events following the Battle of Endor. For me, since the removal of all the Bantam novels as the expanded universe, I find it fascinating to see in which direction Star Wars is moving now. There are two references to The Force Awakens here. Firstly, we see a brief rebel scouting mission to D’Qar, which of course later serves as the main Resistance base. We then see the Battle of Jakku, a year after Endor, that results in both the downed AT-AT and the crashed Star Destroyer. All in all, it’s certainly worth investigating! I’ve pretty much spent all of today building more Dark Angels Deathwing stuff, which has been a lot of fun, I have to say! 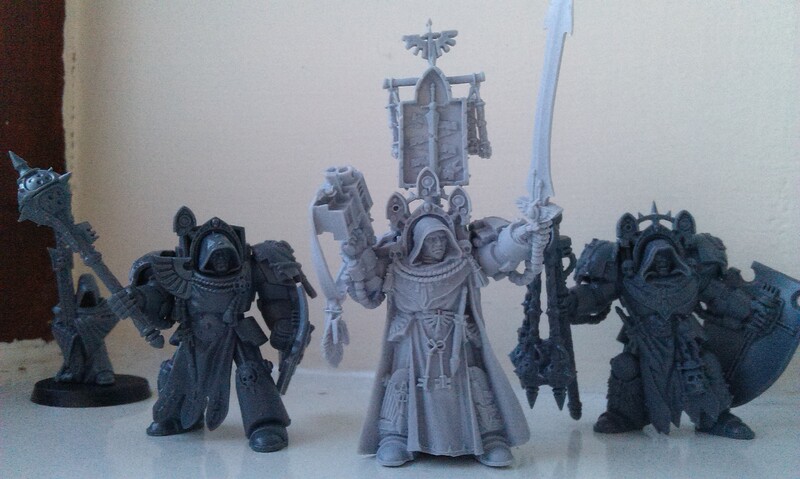 I’ve actually built four of these guys now, along with the Grand Master of the Deathwing himself, Belial! I’m not the biggest fan of Finecast stuff, as have had such little success with it in the past. While this one was a bit tricky to clean up, I nevertheless think it looks great, and hope I can do it justice when I get round to painting it! The Deathwing Knights also look fantastic, I think – I’m particularly looking forward to getting the maces of absolution done. So have an excellent Thursday, whatever you’re up to! Author spalanzPosted on December 24, 2015 Categories Star Wars novels, WarhammerTags Dark Angels, Deathwing, novels, Star Wars, The Force Awakens, Warhammer 40k2 Comments on Christmas eve!